1. Basic Concepts of Process Planning. Introduction. Manufacturing processes and process planning. Composition of machining processes. Requirements for process planning. Basic information for process planning. Economics of process planning. Chapter summary. 2. Machining Accuracy. Concept of machining accuracy. Methods for obtaining required dimensional accuracy. Factors causing machining errors. Methods for determining machining accuracy. Surface quality. Methods for machining accuracy improvement. 3. Technological References and Dimension Calculation. Need for referencing. Principle of coincidence of references. Selection of locating references. Selection of operational references. Recalculation of dimensions. 4. Process Routing Planning.Tasks involved in process routing planning. Analysis of part drawings. Selection of machining methods. Division of machining stages. Concentration and differentiation of operations. Arrangement of heat-treatment operations. Arrangement of auxiliary operations. 5. Machining Operation Design. Tasks involved in machining operation design. Selection of machine tools and tooling. Determination of machining allowances. Determination of operational dimensions and tolerances. Selection of machining conditions. Estimation of time standards. Process plan documentation. 6. Group Technology. Introduction to group technology. Classification and coding. Production flow analysis. Fuzzy-set based PF formation. 7. Computer-Aided Process Planning Systems. Evolution of computer-aided process planning. Variant or generative? 8. Process Planning Algorithms. Issues in process planning. Process planning knowledge. Operation selection. Intermediate surface determination. Application of methodology to CAPP. Determination of optimal intermediate surface specifications. Operation sequencing. 9. Knowledge-Based Process Planning. Knowledge-based systems. Languages and tools for knowledge-based expert systems. Important issues regarding knowledge-based system projects. Knowledge-based systems and process planning. Knowledge acquisition for process planning. 10. Assembly Process Planning. Introduction to assembly planning. Fundamentals of assembly. Data and knowledge processing for assembly planning. Planning for mechanical assembly. Index. Computer-Integrated Manufacturing has gained recognition as a most effective tool in increasing manufacturing competitiveness. This book discusses the fundamental knowledge of Computer-Aided Process Planning, the key to integrated manufacturing. 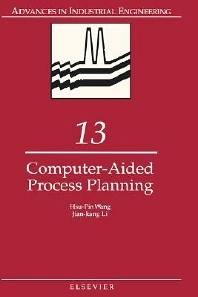 The work provides a rigorous basis for the understanding of process planning and the development of effective and efficient Computer-Aided Process Planning systems. It presents a current overview on the latest issues and directions in this field. Topics covered include Group Technology, process planning algorithms, artificial intelligence, and assembly process planning. Most importantly, in order to provide a solid foundation for discussion and development, basic theories and principles for process planning are comprehensively and thoroughly studied in this book. Written for those who wish to understand the theory of process planning, the book will also prove an indispensable reference source on the approaches, methodologies and tools which can be applied to day-to-day process planning operations.